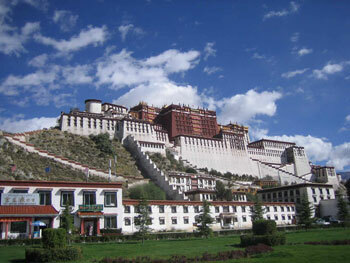 Lhasa, Shigatse, Tsedang, Gyantse are all located in central Tibet. Lhasa- Gyantse-Shigatse-Tsedang Tour Route which is known as the best cultural tourist route in Tibet covers the most majestic cultural museum, the most ancient palace, the most characteristic pagoda and numerous prosperous monasteries. Day 04: Drive to Gyantse via Yamdrok Tso Lake. Day 06: Tashilunpo Monastery and Free Market. Return To Lhasa. Day 08: Drive to Gongkar Airport/Railway Station to Beijing/Shanghai/Chengdu/Xi’An/Xining/Kathmandu. Drolma Lhakhang Temple : Drolma Lhakang temple is situated west of Lhasa about 25kms. It is also on the way to Gongkar Airport. This temple might seems small and have been ingnored by many toursit but this temple has the greatest master Atisha’s life’s last years. This temple is of Drolma or Tara, a famous female bhodisattava. Yamdrok Lake: After an hour driving from Lhasa, you will reach the foothill of Kampa la. From the view point of Kampa La, you will have your best view of Yamdrok Lake. Though you will not see the scorpion shaped lake (view map) but you will see the sky blue water also snow capped in winter. You will drive along the Yamdrok lake for about an hour to Gyantse. On arrival to Gyantse you certain will be tired. Driver and guide will drove you to the hotel where its booked. Take rest and have dinner. Overnight in Gyantse. Today after breakfast, You will drive Kumbum and Pelku Chode. These are the very important sightseeing spots of Gyantse. Kumbum: The first Kumbum was founded in the year 1427 by a Gyantse prince. It has nine lhakangs, is 35 metres (115 ft) high surmounted by a golden dome, and contains 77 chapels which line its walls. Many statues were destroyed during the cultural revolutions and have been replaced by clay images. But it lacks the artistic merits of original. Pelku Chode: Pelku Chode is the Monastery inside the same compound of Kumbum. After finished with sightseeing of Kumbum and Pelku Chode, you will drive to Shigatse. It about 95kms from Gyantse. On arrival to Shigatse you will be drive to Hotel. Oernight in Shigatse. Tashlunpo Monastery: Tashilunpo Monastery was founded in 1447 and is the largest Yellow Hat sect monastery in Tibet. Shigaste is Tibets 2nd most important city and Tashilunpo was the seat of the Panchen Lamas. Tashilunpo contains chortens, temples and the Panchen Lama?s palace. At its peak, Tashilunpo had more than 4,000 monks in its 4 monasteries. Upon the death of a Panchen Lama, it was the 4 abbots of these monasteries that would lead the search for his infant reincarnation.The monastery is a striking red, white and black Tibetan structure with a golden roof. Within the monastery there is a 5 story temple, which contains a 26 meters (86ft) sitting statue of the Maitreya Buddha. The statue was cast from 6,700 ounces of gold and over 115,000 kg of copper, making it the biggest copper Buddhist statue in the world. The massive Thangka wall at Tashilunpo can be clearly seen from most points in Shigaste. The wall is used for displaying enormous Thangkas - religious painted banners - for only a few festival days each year. After the sightseeing and strolling around the free market, you will drive back to Lhasa taking the north route. Overnight in Lhasa. Today after breakfast you will drive to Tsedang via Samye Monastery. Samye Monastery: Samye Monastery was founded in the 8th century during the reign of King Trisong Detsen with the help of the Indian Buddhist masters Padmasambhava and Shantarakshita, whom the king had invited to Tibet to help spread Buddhism. Padamasambhava is credited with subduing the local spirits and winning them over to Buddhism. The first Tibetan monks were ordained here after examination, and are referred to as the Seven Examined Men. Over the centuries Samye has been associated with various schools of Tibetan Buddhism. Padmasambhava's involvement makes Samye important in the Nyingma school, but it was later taken over by the Sakya and Gelugpa schools. Today, Tibetans of all traditions come to worship here. Yumbulakhang Palace: Yumbulakhang is oldest palace in Tibet. Is is also the oldest monumental strcutre in Tsedang. Palace was believed to be that King Nyatri Tsenpo desecended from heaven to built this palace in 2nd century BC. Myths says it is the founding of Tibetan civilization. Yumbulakhang is constructed at the perfect crest of the hill divided into three different components; The tower, the chapel and monks quaters. Tandruk Monastery: Not very far from Yumbulakhang, Tandrk Monastery is situated at the road side. Tran means roc and druk means dragon in Tibetan. The monastery got is name from the legend that it could only be built after Songtsan Gampo had turned into a roc and conquered an evil dragon. It’s said that renowned figures in the history of Tibetan Buddhism, such as Padmasambhava and Milariba, had practised Buddhism nearby after it was built and the remaining relics are Sacred land for the devotees. Trandruk was built during the reign of Songtsan Gampo, and later extensionswere designed by Juequjian of it. It’s said Princess Wencheng stayed and practised Buddhism here at one time and left some relics. Trandruk later converted to Gelugpa and experienced large-scale reconstruction and later it belonged to Gelupa (one of the Sects of Tibetan Buddhism). Overnight in Tsedang. After breakfast fast transfer to Airport for your flight to next destination.